It’s a mystery to me that the film industry has never really figured out what to do with Thomas Hardy. His novels are filled with so much conflict and fatal passion that they should be the perfect raw material for the kind of grown up filmmaking that has independent cinema at its heart and box office ambition in its head. But the problem with Hardy, as with most heavyweight novelists of the nineteenth-century, is that there is always so much more than meets the eye (or the one sentence pitch). While it’s possible to distill his narratives into simple plot lines, the internal richness of Hardy’s greatest novels usually defeats even the most well-intentioned adaptation. And besides, Hollywood is lousy at tragedy. The complexity of knowledge through suffering, the joy of release that comes from having recognised and accepted guilt for terrible wrong-doing; these conventions run entirely counter to a culture predicated on good guys saving the day and heroes and heroines living happily ever after when the curtain falls. As T.S. Eliot observed, human kind cannot bear very much reality. That isn’t to say that Hardy can’t be interpreted successfully. But it’s telling that the most celebrated Wessex film adaptation, Roman Polanski’s ‘Tess’ comes loaded with so much backstory from the director’s own life, that for all its merit as a piece of art, the real Hollywood story is to be found off camera. Since then cinematic versions of ‘Return of the Native’ and ‘Jude the Obscure’ have largely sunk without trace. It’s going to be tough on popcorn sales when one of the central characters is a landscape: the impersonal, non-rational presence of Egdon Heath. And a scene where a bunch of children commit suicide by hanging themselves was never likely to inspire box office records in Middle America. 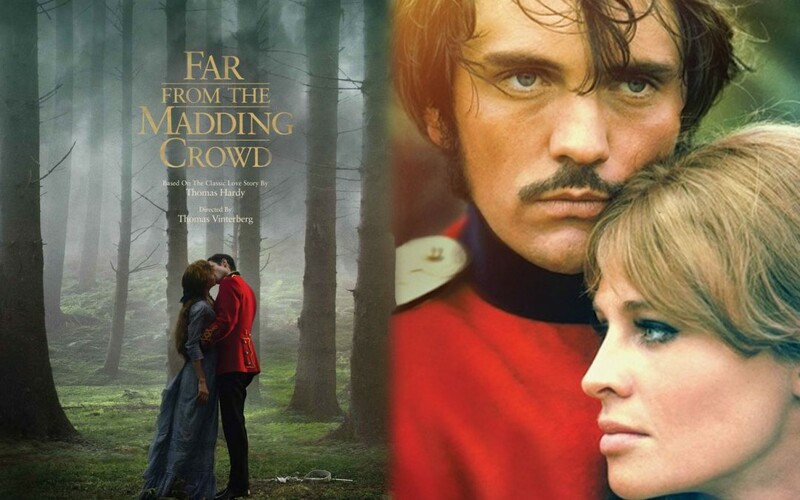 So where to put ‘Far From The Madding Crowd’, a novel that sits earlier in Hardy’s canon compared to those others? Does it come closer in story and style to that well worn phrase beloved of studio execs and audience focus groups: ‘they lived happily ever after’? Perhaps. Although the story of ‘Far From The Madding Crowd’ centres upon a romance and the triumph of patient, enduring love, it still puts the audience through the wringer before the credits roll. And whilst it’s true that Gabriel Oak and Bathsheba Everdene finally wed, it takes death, destruction and ruin for their union to be fulfilled. Conventionally in tragedy, the hero or heroine suffer mortal harm to reach their truth, but in ‘Far From The Madding Crowd’, Bathsheba reaches her insight through the griefs and even deaths of others. Francis Troy and Farmer Boldwood are the men who pay for her mistakes in blood and turmoil. Meanwhile, her new husband forsakes the opportunity for a new life in America to marry the woman who spurned him. Whether Gabriel makes a wise choice remains unknown as this is the point where the story ends. Hardy attracted controversy throughout his career as a novelist and Bathsheba’s unwillingness to confirm is a classic example of his tendency to provoke popular mores. Certainly, much suffering could have been avoided had Bathsheba simply accepted Gabriel Oak’s first proposal. By the conventions of Victorian marriage, his offer was a good one and women, generally, did not refuse solid offers of marriage, especially from those who may have been above their social standing, as Gabriel appears at the beginning of the novel. Thankfully, creating a female character who played it safe was never Hardy’s intention. Although there are several key moments where Gabriel saves the day, Bathsheba remains true to herself. Even the scenes where she depends on Gabriel’s support do not undermine her independence: she makes mistakes, but she admits to them and the setbacks never weaken her resolve to keep making choices and decisions for herself. Bathsheba Everdene is charismatic – cinematic even – precisely because she does things that confound expectations. The other interesting aspect of her character arc is that although she becomes financially independent as the novel progresses, this economic freedom seems to constrain her choices by making her a target: for Boldwood’s obsession and Troy’s opportunism. Freedom in the public space, by virtue of her wealth, becomes a snare to entrap her. In Victorian England, it was unusual for women to enjoy such financial liberty and this makes Bathsheba different to other literary heroines of the period. Unlike Dorothy Casaubon in ‘Middlemarch’ or Diana Warwick in ‘Diana of the Crossways’, by rejecting Gabriel she makes a deliberate choice to remain her own woman, rather than finding it belatedly once the death of her spouse provides release from a miserable marriage. And although Bathsheba finds herself in a situation not dissimilar to that of Helen Graham from ‘The Tenant of Wildfell Hall’ in marrying an unsuitable, abusive husband, Troy’s mysterious disappearance gives her a relatively swift escape route. Of course, she is still dogged by Farmer Boldwood’s almost stalker-like pursuit, but at least this is an external pressure rather than a misery she has to tolerate beneath her own roof. Having said that, what we feel less strongly today is the claustrophobic nature of conventional morality that women in Victorian England could never truly escape, however self-possessed they might have been. Although Troy is gone, it is questionable whether Bathsheba feels truly free of the burden of doing what would appear (to most men of the period) to be the ‘best thing under the circumstances’. In the hours before the fateful engagement party, we get a great deal of insight into her unhappiness at feeling almost duty bound to marry a man she respects but knows she can never love. With all of this in mind, therefore, how does the 2015 version of the novel compare with the classic 1967 production directed by John Schlesinger? After all I’ve just written, surely one would expect that the modern adaptation would be the more successful. Even though the first film was made at the end of the revolutionary 1960’s, our notions about relationships and gender roles have moved a long way from the stifling confines of the late nineteenth-century. And in Thomas Vinterberg, we have a true modern auteur director, a luminary of Dogme and a close associate of Lars Von Trier. Has he been able to breathe new life into the complex relationships that weave like a fault line through the lives of these characters? It’s worth pointing out that at the time he made his version of Hardy’s film, Schlesinger was regarded as a pioneer of contemporary realism, having just completed ‘A Kind Of Loving’ and ‘Billy Liar’, both landmark features in the British New Wave school of cinema in the mid-1960s. And although one might have a tendency to regard Vinterberg’s film as being younger and fresher, Schlesinger was actually five years the junior when both directors made their attempts at translating Hardy’s novel to the screen. For his next movie, ‘Midnight Cowboy’, the English film maker would go on to win an Oscar for Best Picture, Best Director and Best Adapted Screenplay. He’s a difficult act to follow. One of the key differences between the 1967 and 2015 films is compositional. The camera angles in the modern production are much tighter, which means far more scenes are filmed in close up and rely on cutaways between speakers rather than placing the dialogue in the whole scene. We’re used to seeing this beat driven ‘to and fro’, in television but here it has the tendency to domesticate the action, like a soap opera. We are far from the madding crowd but we still need to be aware that it’s there. In contrast, Schlesinger’s movie has more openness and broadness in terms of landscape and setting. There is a greater sense of drama unfolding against the eternal backdrop of the seasons, so that the human conflicts are tied to the natural cycle that sweeps the characters forwards like motes upon the vast backdrop of Wessex. It helps to have the edge and unsentimental sparseness of Richard Rodney Bennett’s original score for the 1967 film. By comparison, there is too much “Lark Ascending” / Classic FM pastoralism in the modern version and an over-dwelling upon beautifully lit moments which feels a little obvious at times. Another criticism I would make is that Tom Sturridge seems too young for the part of Francis Troy, while Carey Mulligan’s Bathsheba is far less charismatic than Julie Christie in the same role. It’s hard to follow in the footsteps of a legendary actor but Ms Mulligan doesn’t really seize the film and exploit the unique potential of Bathsheba’s character. Her performance, to me, at least, felt quite safe. Sturbridge’s casting is particularly problematic. He completely lacks the maturity and swaggering calculation that made Terence Stamp’s Sergeant Troy both likeable and diabolical. This Troy is immature, not rakish. His reaction to Fanny Robin’s mistake seems petulant, rather than proud, and his courtship of Bathsheba resembles that of a well heeled young chancer in a night club; a public school peacock who takes entitlement for granted having known nothing else. Other key plot moments that the 1967 movie retained are mishandled or just changed to suit the sensibilities of the 2015 version. When Fanny Robin is late for her wedding service it is not clear that she goes to the wrong church and we don’t get to see Troy’s furious reaction which gave us some insight into his unyielding character. Most disappointing of all, the ‘Please don’t desert me’ episode in the recent film is entirely invented to show Bathsheba riding after Gabriel in order to ratchet up the emotional bond between them. Whilst it reassures the audience that sooner or later, this guy will get this girl, it also dilutes the tension and plays to the convention that when things get tough, every woman needs a strong, silent hero to come to the rescue. In the first film, as in Hardy, the sexual politics are a lot more complex. Bathsheba initially refuses to reach out to Gabriel even when he is her only hope, and having done so, refuses to come to him as he demands. Instead of asking directly for help, she appeals for him not to desert her, which suggests two people working together on a common cause, not one surrendering to the other’s will. In other words, not, “Please come and rescue me” but “Please don’t leave me to fight this battle on my own.” The note that eventually persuades Oak to return, both in the book and the 1967 film, is as good as he is going to get, and he realises this, laying the foundations for the pact the pair make before they get married. This is why it weakens the later version to make Bathsheba seem so dependent on Oak. The famous swordplay scene in the hollows is justifiably held to be one of Hardy’s finest pieces of writing and, by implication, one of Victorian literature’s great moments. The description of how Bathsheba is overwhelmed by thought, emotion and setting is so psychological that no visual interpretation could ever really do it justice. Schlesinger’s interpretation now looks a little silly to a modern audience weaned on CGI and Thomas Vinterberg wisely avoids such visual flights of fancy. In this respect, the later film deals with this critical moment far more effectively even though it remains a perfect example of how film and literature are completely different art forms, requiring great skill and imagination sometimes to bring them together. The confrontation between Troy and Gabriel over whether to cover the ricks as a fierce storm approaches is another invented plot device that feels artificial in the 2015 release. The director’s intention is to show the antagonism between the two men but it’s achieved in an artificial, reality TV standoff that exaggerates what is really happening. And Bathsheba’s role (or lack of) is crucial. The scene is played as a straight power struggle between the two men but I find it hard to believe Bathsheba would have become so passive over something so critical – effectively the future of the farm – in such a short space of time. In general, Bathsheba’s surrender to Troy in the modern version feels too abrupt. This compression of events means there is less conflict between Troy’s seduction and Boldwood’s dogged pursuit, less opportunity for the older man’s humiliation to develop and harden. Bathsheba’s own explanation for marrying Troy feels jumbled and rushed, (she refers to a key scene that we actually don’t witness in the modern version) so there is little to justify the abrupt change of heart. In Schlesinger’s film, the audience senses Bathsheba’s desperation to shake off the farmer without being completely cruel, and her allurement by Troy has a far greater sense of daring and recklessness. Interestingly, one character dominates both movies and it’s neither Gabriel or Bathsheba: Farmer Boldwood. Peter Finch’s portrayal of the farmer in Schlesinger’s movie is more fatherly and patrician, and he delivers a performance that is often unsettling for its intensity. As he becomes more obsessed with Bathsheba, Finch’s Boldwood increasingly appears to be walking along the edge of madness, perhaps a little too much so in terms of theatrical impact. Michael Sheen’s interpretation is more subtle, controlled and, arguably, tragic. For me, Sheen gives the outstanding acting performance in both films. His Boldwood is portrayed as a man lost in life and then reawakened by his awareness of feelings for Bathsheba. The scene where he and Miss Everdene sing at the harvest supper is beautiful and heartfelt, a tipping point where parallel universes intersect and for a few tantalising moments, what can and will never be, is just within reach. Sheen’s performance, as always, is excellent, fully conveying to the audience the anguished tension of unrequited love. It is just a shame that in the 2015 version of ‘Far From The Madding Crowd’, this brooding presence is underused. I think the film needed more of Sheen’s torment, a fact that is exposed by the terribly mishandled denouement where instead of the awful confrontation where Boldwood shoots Troy before a horrified crowd of onlookers, Vinterberg stages the crime privately, outside of the house. The title of the novel was ironic. Hardy was suggesting that even in the quiet places, human passion and emotion can be violent, overwhelming and universal. But in the 2015 film, that passion and violence is literally far from the eyes of witnesses and as such, loses its power because when the dam finally breaks, there is no one around to see it. I love Thomas Hardy’s novels and I enjoyed both films. But in the end, the more classic and faithful interpretation of novel, the 1967 version directed by John Schlesinger wins hands down. It’s slower – a good fifty minutes longer, in fact – but this enables the tragic inevitability of Hardy’s work to build to its terrible, inexorable climax. By contrast, the more rapid and condensed modern version is shallower and ultimately feels superficial. With the exception of Michael Sheen, everything about it is lightweight: beautifully filmed and polished, to be sure, but ultimately lacking in depth and substance.